David Rock Feinstein is the guitarist for the Metal band THE RODS. 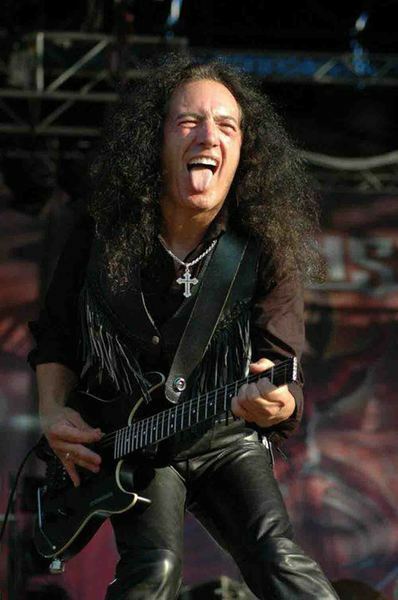 He is Ronnie James Dio’s cousin, and was the guitarist in one of Ronnie’s early bands, called Elf. Previous to that he was in a local band in Central NY called The Cindells.Energetic, electrifying, immortal…just some of the words used to describe Magic Circle Music recording artists, Feinstein! 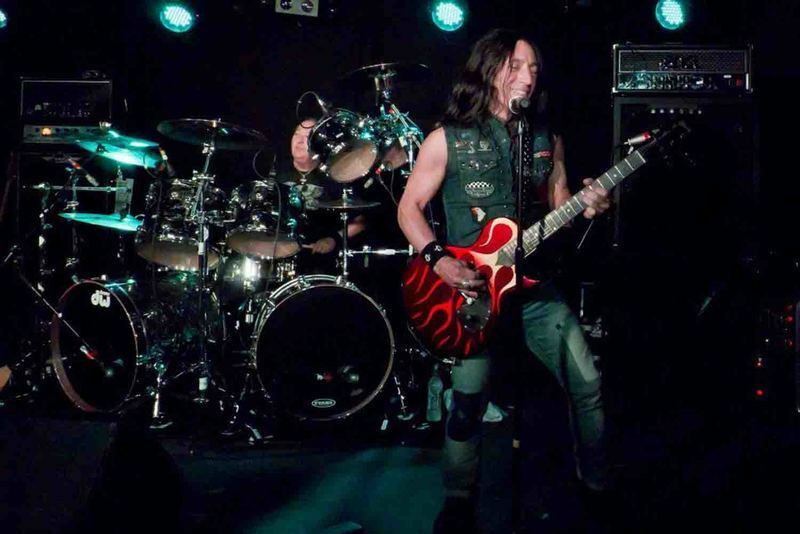 And with release of the album “Third Wish,” a new era of “slash and burn” is certain to ignite for the man behind the name—David “Rock” Feinstein!The moniker should not only ring a bell in the minds of true metal devotees, but also leave famished metal fans quivering in anticipation. As the original guitarist with the band Elf (the group that eventually became Richie Blackmore’s Rainbow) and the lead guitarist/vocalist with the now legendary heavy-metal trio The Rods (purveyors of sinfully molten metal), David “Rock” Feinstein has certainly assured himself a name in the annals of rock ’n’ roll. His barnstorming, take-no-prisoner’s style of guitar playing shredded the grooves of The Rods eponymously-titled debut album, waving the banner flag for the New Wave of Heavy Metal that thundered through the ’80s. With six subsequent albums, including “Wild Dogs,” “In The Raw,” “Heavier Than Thou,” and the blistering “The Rods Live,” The Rods proved more than capable of penning mega-decibel poetry—according to more than one journalist. After numerous tours, the band left behind a trail of destruction throughout the States and Europe with their fans absolutely craving for more.And now comes the band Feinstein, with “Rock’s” guitar once again taking unshakable and determined control, delivering both robust blows and disciplined caresses in equal yet magnetic proportions. The man seems inbred with rock ’n’ roll fever—“All of us that played instruments, started in high school,” says Feinstein. “It was a fun thing to do…we didn’t care about money, we just wanted to get out there and blast our way to the top!” It’s unlikely the man will ever forsake that youthful “staunch and rebellious attitude,” as the current music undoubtedly demonstrates metal is bred in the bone!This bone-breaking debut album from Feinstein, “Third Wish,” proves just that, with ear-battering tracks of melody and metal, primed and armed for another worldwide onslaught. The sound is both raw and mammoth, seasoned and dynamic, bluesy and ballsy, leaving no doubt in the minds of the legion of listeners that David “Rock” Feinstein is back—with a bloody vengeance! Guitarist/singer David ‘Rock’ Feinstein should be known by you as the main man with the band The Rods and some solo CD’s like the 2004 monster CD ‘Third Wish’. He is also a cousin of the deceased Ronnie James Dio. In the early seventies they both played in the formation Elf when Ronnie got recruited by Ritchie Blackmore to form Rainbow. Several other Elf members made the switch as well but for David Feinstein there was no position available as Ritchie Blackmore did not want a second guitarist in his band. So Feinstein later formed The Rods with drummer Carl Canedy and bassist Stephen Farmer (later replaced by Gary Bordonaro) and did quite well with that group with albums like ‘Let Them Eat Metal’, ‘In The Raw’, ‘Wild Dogs’ ‘Hollywood’, ‘Heavier Than Thou’ and their latest one ‘Vengeance’. 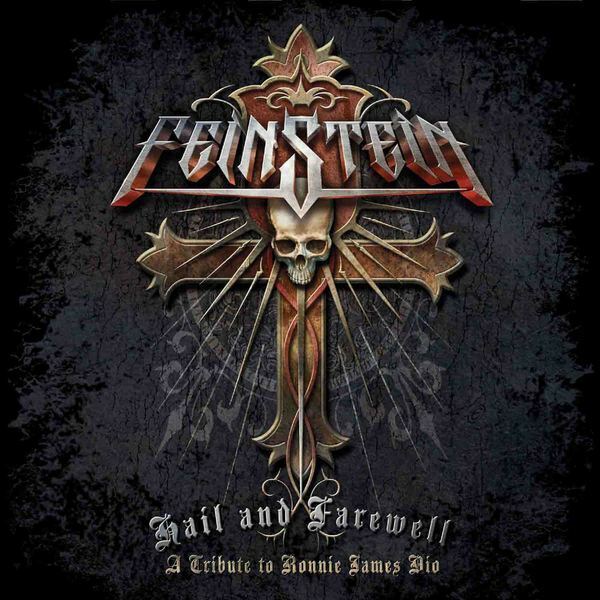 About seven years after the passing of Ronnie James Dio David Feinstein recorded and released a tribute CD to his cousin. I got the CD through CD Baby as David has not found a record company to release this product or maybe he wanted to release it by himself. It is not surprising that David has got some help from his The Rods mates Canedy on drums and Bordonaro on vocals. 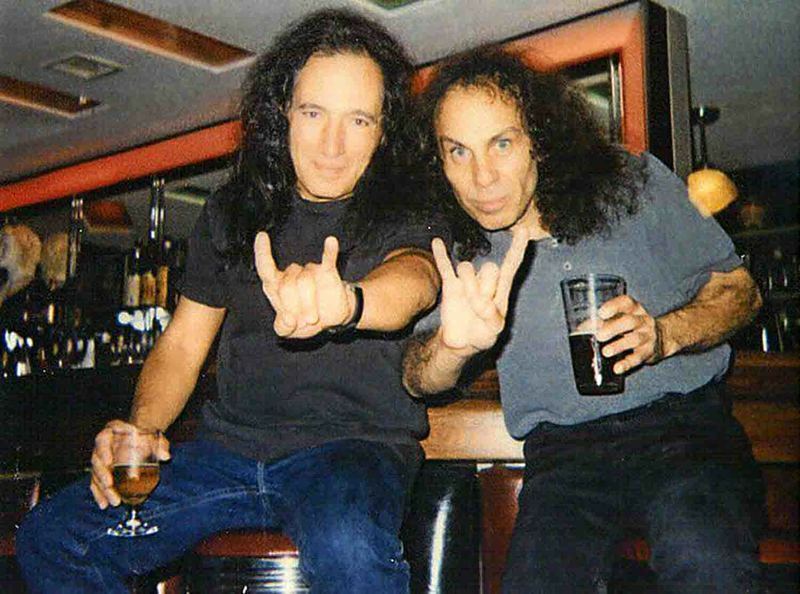 David must have dived into the archives as the inside of the CD sleeve features a lot of old pictures of Dio and Feinstein together in their younger days. Belgian designer Eric Philippe has come up again with a tasty looking cover design and logo, so it all looks very professional indeed. For the music that David has written we can say that there are a few surprises. A guy called Lonnie Park has assisted David with the production and done some singing and played keyboards. Knowing the music of The Rods and the Feinstein solo material ‘Hail And Farewell’ sounds from time to time a bit different. The bulk of the songs are clearly in The Rods style with David’s ‘dark and heavy’ riffs and typical voice setting the tone on tracks like ,,Witches Brew’’, ,,Kill The Pain’’ and ,,Give It To Them Hard’’, but there are also some songs that have a clear Rainbow ‘feel’ with a lead role for the keyboards as well as the guitar (,,Chasing Rainbows’’, ,,Hold On For Your Life’’). The lyrics are partly about Ronnie’s life and in some cases are indeed a big tribute (the title track and ,,You Are My Hero’’) to the master and I believe that David Feinstein has done his work with love and integrity. Still, in the vocal department there are some remarks to be made. ,,You Are My Hero’’ and the short track ,,A Hero Is Born’’ are being sung by Eleanor Feinstein Phalen. The lady in question has a bit of a monotonous voice and I wonder why David did not ask singer Shmoulik Avigal to participate. Shmoulik sang on The Rods CD ‘Heavier Than Thou’ and has a past in The Netherlands with the bands Hammerhead, Picture (he sang on their best album ‘Diamond Dreamer’) and Horizon before moving to America. The man has a vocal sound that has often been compared to Dio so it would have been an idea to involve him. That did not happen. ‘Hail And Farewell’ is a quite decent heavy rock CD with some good songs but also a few ‘less’ moments. All songs written by David "Rock" Feinstein.Additional Lyrics on "Hold On For Your Life" and "Give It To Them Hard" by Lonnie Park.